Sweet tooth cravings? 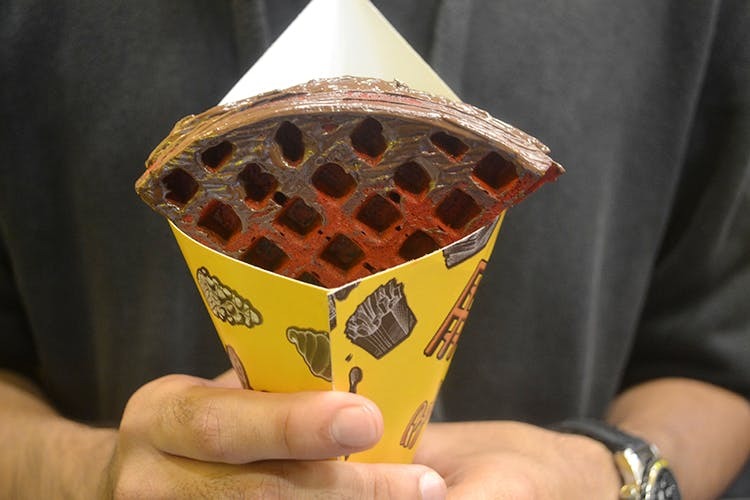 Belgian Waffle Factory is just the place to head to for some waffle sandwiches dripping with chocolate sauce and bubble waffle wraps loaded with toppings of every kind. Or even make your own! Every sweet tooth’s dream begins with Belgian Waffle Factory’s options of bubble wrap waffles and Belgian waffle sandwiches. Their Belgian-style waffle chocolate sandwich, made from a chocolatey batter is cooked to perfection. Spread it with copious amounts of Nutella and milk chocolate sauce both inside and outside, and add toppings of chocolate chips to this heavenly creation, and you have The Sin. Try the savoury waffle sandwich that comes with french fries, mini chicken patties, and three kinds of sauces — mayo, spicy, and chipotle. For all out carbs, the bubble waffle wraps such as the Around The World Berry or Bubble Special? One comes loaded with blueberry and strawberry compotes, ice cream, and dark chocolate while the other is loaded with whipped cream (ours came with cream cheese), milk chocolate and blueberry compote. We absolutely love that you can customise your waffles too. Their waffles, both the regular and bubble come in different flavours such as chocolate, pineapple, green apple, coconut, and red velvet -- and the colours change accordingly too! Choose to top them with bananas, strawberries, marshmallows, GEMS, Oreo, dark chocolate sauce, Nutella, salted caramel, dry fruits, and so on. If you’re heading there, also check out Chettas, behind St. Joseph College of Commerce to have their legendary Oreo Shake. Oh, and apart from waffles they do snacks such as potato twisties, French fries, and tater tots.